1. Name 3 things that you love about Wolves. The goth/horror fan in me loves the ferocity of wolves and other predators, but I also admire their loyal nature to the pack and their amazing endurance - some hunts can go on for hours! 2. Can you remember when you first became fascinated by them? I always loved animals from as far back as I can remember and I think I was pretty young - maybe around five years old - when I latched on to wolves as 'my animal' and developed a real fascination with them. 3. Can you explain why you became interested in Werewolves instead of REAL wolves? I think my love of werewolves probably started with the feeling as a kid that humans are pretty boring as a species - we have no natural weapons and if it weren't for opposable thumbs we'd have never climbed up the food chain! The idea of being able to transform into something more powerful really grabbed me, and I was fascinated by the idea of both shape shifters that could become full animals in form as well as the type of 'bipedal' werewolf described in Hybrid. I remember getting Altered Beast for the Mega Drive and thinking it was the best game ever, and I would complete it over and over again on a weekend and in school holidays. I loved the idea of becoming a creature that not only had the ability to use tools like a human, but also had the natural weapons, power and ferocity of a great predator. 4. Have you read any Werewolfish novels before? And if so can you recommend any? Yeah I've read a few; I think my first was probably The Werewolf of Fever Swamp in the Goosebumps series by R.L. Stine! Those books were all the rage growing up in the 90s; I had dozens of them. As a young adult I discovered The Wereling trilogy by Stephen Cole which I really enjoyed, and more recently a friend bought me High Moor by Graeme Reynolds which I would highly recommend - I'm eagerly awaiting the third book to come out. I also love M.D. Lachlan's Wolfsangel series which is a really awesome original spin on the classic werewolf myth. 5. Did your interest in Werewolves begin as part of your interest in Horror? That was probably part of it yeah; I was always fascinated by horror monsters and the supernatural, and werewolves were the ones I really connected with for reasons mentioned above and because of my love of wolves. I've always enjoyed reading the folklore and mythology behind many of the popular monsters we still talk about to this day, as well as discovering more of the obscure legends from different parts of the world. 6. Where did the idea for Hybrid come from? It all started with my cousin 'Lady' Sarah. She's also a big horror fan, although her favourite monster is vampires rather than werewolves, and many of the visits to my Aunt's would be spent talking to Sarah about the latest horror movies when we were younger. She'd written a short fantasy story which I loved but she got fed up of me nagging her to write more, so eventually she encouraged me to write my own and we had a brainstorming session for the first three chapters. Sarah didn't have to ask what I would want to write about - it was always going to be a werewolf story and I think the first thing she said was something along the lines of "Okay, if you're going to get turned you first need to be bitten and somehow survive the attack." Originally it was intended to be a short story like she'd done, but I would be sat in school daydreaming while teachers droned on and all these ideas would come to me. Some were inspired by real events that happened at school while other scenes were completely fictional. I soon realised I had a novel in the works, and then when more ideas came that went beyond the ending which had already come to me for book one, I decided it was going to be a series. 7. How long did it take you to write until it was ready for Wild Wolf to publish it? I started the very first draft back in my GCSE years at school, twelve years ago! I finished the first draft just before starting college, but then the manuscript was sat on my computer awaiting a much needed rewrite. When I eventually went back to it in my early twenties I realised the 'instant bestseller' my fifteen year old self had been convinced he'd written needed a major rewrite before it was publishable. The plot hasn't really changed since the very first finished draft, but the narrative took a lot of work to get right. The original version read much more like Anne Rice's Interview With A Vampire - I remember a friend recommending I should read it and I was like wow, this is like Hybrid but with a vampire instead of a werewolf. That worked for Anne Rice's novels, but I felt the original Hybrid was just too depressing, mostly because school was a dark time for me in real life as well as for my character in my book, and I struggled to read through it when I was in a better place. So I tried to make the tone more light hearted in the early chapters to make it more readable and to give it more of a contrast between the mostly average teenager we meet at the start of the book, and the changes he goes through as a result of the curse and the horrific things it drives him to do, which took a few months. When I first contacted Wild Wolf after three years of unsuccessful submissions to literary agencies, they advised it still needed work before it was ready for publishing and that I should try and think about the target audience to help get the tone right - was it aimed at young adults or was it 'full on adult horror' as they put it. I had always intended it to be for adults and I realised the redraft had become more young adult in the early chapters, so then I spent a really intensive month giving it another major redraft, which involved many late nights/early starts. Some of the chapters have remained virtually untouched from when I first wrote them at fifteen, but chapter one was completely reworked during the first redraft and then it needed further work to make the tone more adult again, and chapters three, four and five also went through a lot of rewriting before I resubmitted to Wild Wolf. 8. Did you ever come across the legend of Fenrir the wolf from Norse Mythology? Yeah, I do like some Norse mythology and I am really enjoying the TV series Vikings. I can't remember when I first read the legend of Fenrir online but once we got the internet in our house in my teens that was it - I would spend many evenings researching the myths and legends I'd always been fascinated by, and I probably saw a link to the story of Fenrir on a werewolf site somewhere. 9. Do you know much about wolves or werewolves in other legends & myths? I've read up on many different werewolf myths and legends. There's the story of Lycaon in Greek mythology which I used for the believed origins of my werewolves in Hybrid and there's also Romulus and Remus who were raised by a wolf according to Roman legend. There's a few other stories from around that time in history and then there was a resurgence in the widespread belief of werewolves in the Middle Ages. Some of the older werewolf and vampire mythology is almost interchangeable, and the belief in shapeshifting is worldwide - generally in local folklore the person becomes whichever is the biggest predator in that region, so in Africa you have werelions and wereleopards, and in India weretigers, etc. The idea of werecreatures is as old as mankind itself, according to experts who've discovered cave paintings depicting animalistic humanoids. I could probably fill a non-fiction book on everything I've learned over the years about werewolf mythology! 10. What do you think makes Hybrid different from other werewolf novels? 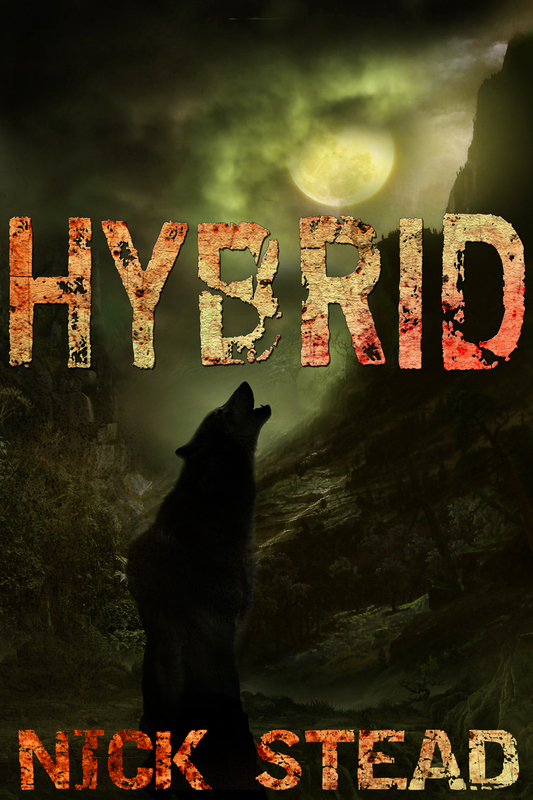 I think Hybrid really explores the classic werewolf story to a new depth that's not been done before (at least as far as I'm aware). I took my knowledge of the different beliefs around werewolves that have been around over the years and then used my favourite myths to create the 'rules' for my werewolves, as well as some of my own ideas. I tried to think about why the full moon is often a blackout period in many werewolf stories, and then I thought about real world personality disorders where a person can't remember what they did when their 'other' self was in control. That gave me the idea of treating the werewolf curse like a split personality, which meant the wolfish side to my character's personality became a character in himself. By setting the novel over the course of a year it gave me the freedom to explore how the curse might change a person gradually, over time. There's also other things going on with the idea of the Demon Slayers and the secret war going on which will come into it more in later books, but the primary theme of the first novel is change, not just for the main character as a human but also his inner wolf evolves somewhat over the course of the book.